Perhaps the wildest thing for me is simply the number of jobs that I cycled through in my 13 years in NYC. As an actor, your part-time jobs need to be disposable so you can take off for acting work. Then, when that show ends, you find yourself a new part-time job. My first paid job in and out of school was as an entertainer at children's birthday parties. I played everything from the Pink Power Ranger, to Jasmine, Pocahontas, Snow White and even the world’s shortest Barney for a party in a penthouse of Trump Tower. I ran a preschool indoor play park. I bartended in a nightclub/bowling alley (it was cooler and weirder than it sounds). I was a manager of a rehearsal space in Midtown. I was a babysitter, a waitress at a top NYC restaurant, a cocktail waitress, a hair salon receptionist, and some kind of temp in some kind of office doing some kind of filing. Being an elf at Macy's would have been pretty good casting for me... I probably should have looked into that! As a teenager, I lived with my father each summer in Alert Bay, an island off the northern tip of Vancouver Island in British Columbia. One summer I worked in the shipyards. My job was to scrape old “anti-fouling” paint off the hulls of ships and re-paint them to stop teredo worms from ruining the wooden fishing boats. They were long days, and the paint—both old and new—was full of arsenic and other now-banned chemicals. All day I was reaching up to the dry-docked hull—fragrant with the rotting stench of dying barnacles and seaweed. My body ached as small bits of the paint fell on my face or trickled down to my arms and etched the surface of my skin. I remember it took months for my faux-freckles to disappear. That job was not my favorite. I worked as a dog walker in Chicago in the middle of January. During the coldest week of the year a dog bit me, a dog threw-up in my car, and I set off a home alarm system resulting in a virtual police squad showing up. Then, there was a Golden Retriever with diarrhea and a hole in the bag (use your imagination). I also had to change a very unhappy dog’s diaper twice a day, and chase a pair of runaway pugs (one of which would not stop making pug-love to my leg after I caught them). I still love dogs. But I own a cat now –who requires no walking. In keeping with the Santaland theme, I was also in a series of commercials as the holiday spokesperson for a Midwestern hardware store. In the picture below, I am an elf and that is Rowdy the Reindeer (who got very nervous and made quite a mess on set). 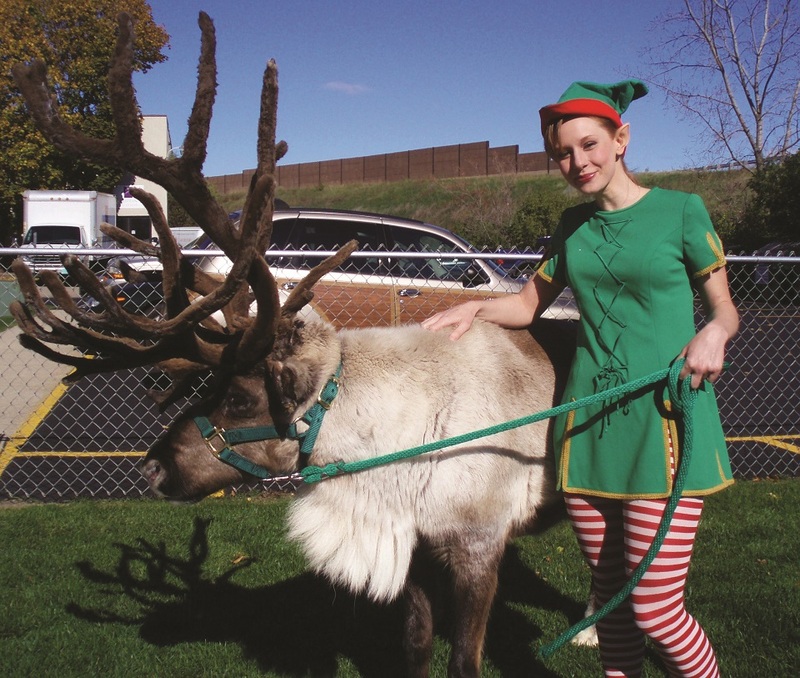 Emily Trask on set with Rowdy the Reindeer for a hardware commercial.